If you have an open web service that your customers can call then you must be prepared to have different versions of the web service available. Your customers may have scheduled calls to your web service so that they can build reports or whatever, without getting an exception. At times a new version of your web service will contain breaking changes. If you deploy that version then the clients of the web service won’t be impressed even if you send out emails and prepare them for the change. They will have to follow you and it will consume their time. Instead, you can build new versions of the web service without affecting the old version and the clients can update their systems if and when they wish. You can just inform them that there’s a new version available and this and this call will require an extra parameter. …where ‘current’ always contains the latest version. Some clients may always want to use the most recent version of our service but they need to understand the risks. The version can be inserted using IIS. Within each version folder you can have subfolders following the conventions at your company, e.g. Staging, Live and Backup. 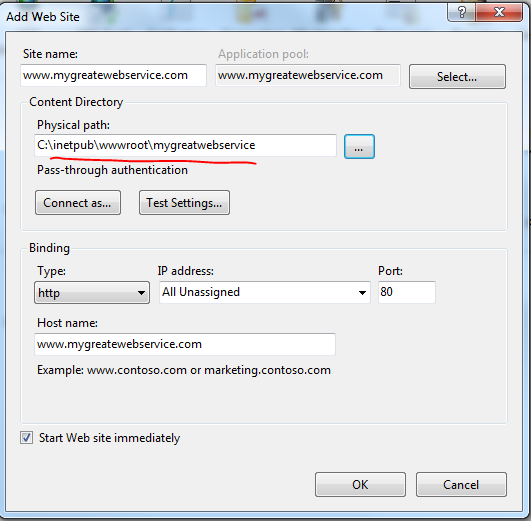 Just make sure you deploy the right version in each version folder and IIS will direct the traffic to the correct subfolder based on the first section in the path. This tutorial solve my quastion.